I recently did a search on the internet, to understand what are the top HR topics that are being researched or looked at by people in the industry. It makes for fascinating reading. Some of the items searched are about building teams through team effectiveness, how to build effective appreciation models for employees, or dealing with bad bosses. Issues such as helping and working with millennials, health care options, and wellness models come up regularly too. A favorite topic, of course, is whether or not performance review processes are good, or bad or should be implemented or removed. The favorite for me was the one that says, “How to get an employer to fall in love with you!” Well, I think as an HR person, that’s probably a bit of a stretch! My guess is that for an HR professional, this is not going to happen easily. Perhaps it is more of a question to get an employer to fully respect you, your position and the things that you are required to do. But the one thing that is completely missing for me in all these searches is – how does HR add value to the bottom line? What are the impactful things HR can do to move the business forward and help future proof the organization in times of increasing change and uncertainty. I think, first of all, HR professionals and HR leaders need to take their teams from transactional thinking into strategic thinking. A lot of the times HR people are stuck in transactional work and they rarely have an opportunity to think about strategic HR. Whilst it is undeniable that HR has a seat at the table, the bigger question is – how do you use that seat and innovate HR? Using your seat to add to the bottom line and to add real value to the business. To implement techniques, processes and structure to help the organization think differently, and to come up with innovative and creative ideas and alternatives to move the business forward. It is when HR professionals move outside of their comfort zone, out of transactional work, into strategic and value add work, that they experience a far more fulfilling and aspirational career. It’s almost like being a passenger on a plane and moving from the passenger seat, into the pilot seat. To take control of your HR function and move it forward. I’m going to run a series of webinars discussing those steps that needs to be taken, to help your team to move from transactional to strategic HR. We will discuss what those steps are, how to go about determining the right priorities, how to determine what the right metrics are, and how to implement a strong governance process to support the innovation process. The webinars will be short and impactful, and participants will walk away with a better understanding on how to move your team forward, from transactional work, to strategic work and how to innovate HR. How to make sure the team remains accountable and committed to the process. 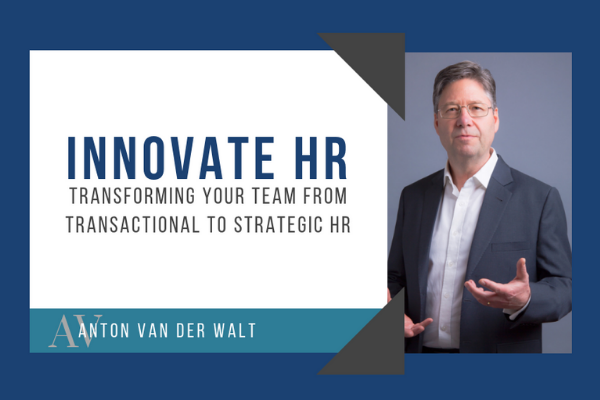 The link to the webinar “Innovate HR – how to move your team from transactional to strategic HR” is below. Registration provides you with the option to choose a date and time that suits you. 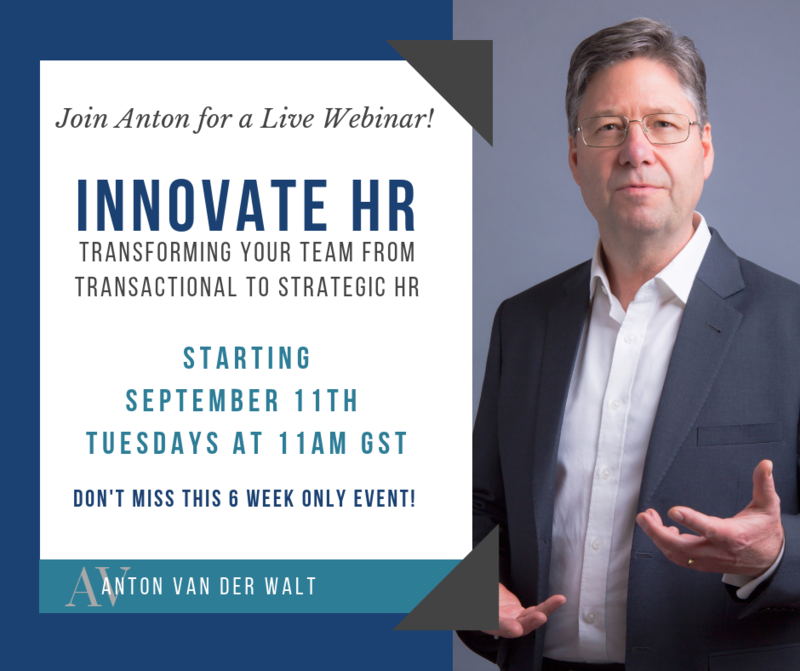 This is a series of webinars and whilst the “Innovate HR” theme of each webinar will remain the same, each webinar will be unique, each with its own ideas and practical solutions. Should there be an opportunity for you to attend on multiple dates, this would be of value to you.